WE ARE A RESPONSIVE PRINT COMPANY WHO DELIVER QUALITY INTERACTIVE MARKETING MATERIALS. WE BRING YOUR DESIGN IDEAS TO LIFE, MAKING YOUR BUSINESS LOOK GREAT! 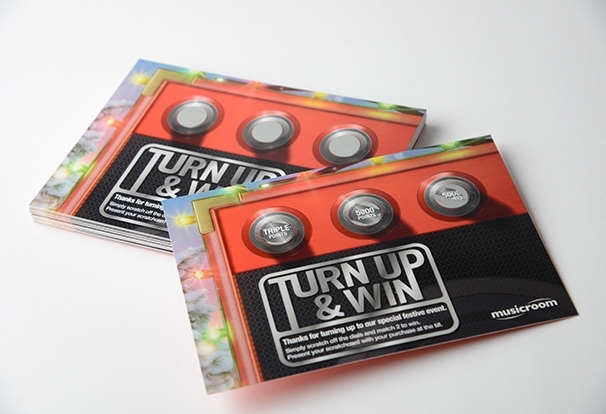 At Purely Digital we are experts in printing latex or foil scratch cards. 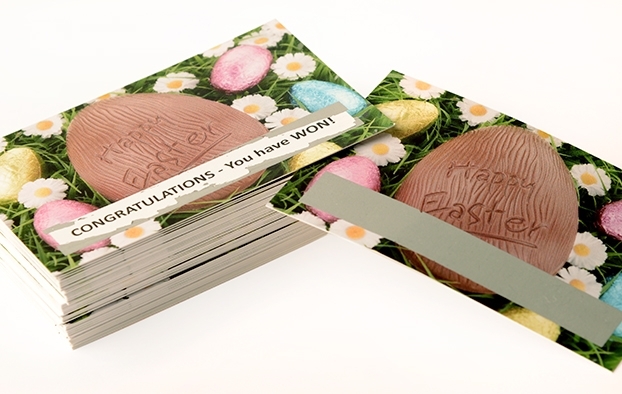 We can print short run campaigns starting from 10 to 200,000 scratch cards. We believe in flexibility, so we encourage you to design the scratch cards that will work best for your promotion. Feel free to create your design knowing that we can customise the scratch off area, the card shape and provide personalised prize images in black or colour. You can use either gold or silver scratch off, or a more secure foil if needed. We can also enhance your scratch cards with colour or black overprint. 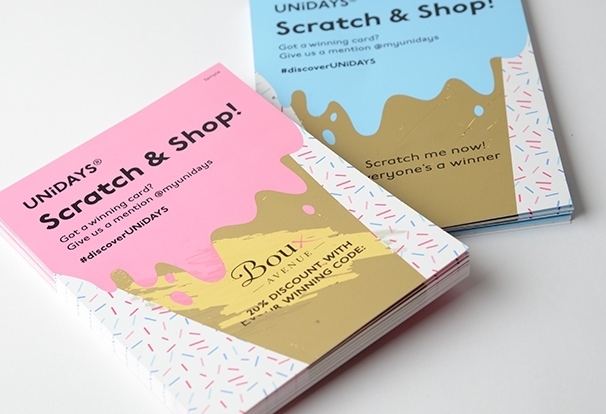 Do you need to track your scratch cards campaign? We can personalise your cards with unique serial numbers, so you will know what prizes have been claimed and what remains. Our team are always happy to help. We will freely advise you regarding the technical aspects involved. If you are not sure what design will work better for you? Our design service is available for your convenience. Scroll down the page to view commonly asked questions and answers about our scratch card printing services. These questions are updated regularly, so if you have a question to ask just get in touch and this could be added to our list. What can the shape of the scratch off area be? customers are after a simple rectangle and that’s fine too! A more unusual shape won’t cost you any more than a generic one. Cost is only likely to go up if you require a much bigger latex area on a big run. Can the scratch panel be over printed? that we printed where the number of each day of advent was overprinted in black on to the latex. Generally, overprint works best in black, but it can be done in other colours (as illustrated in the example), however the colour overprint is a time consuming process, so it’s something that we recommend for small runs only. How long do scratch cards take to print? Can all the cards have a unique code on them? helps you trace your cards. We can also foil with security holograms on to your scratch cards to help verify their authenticity. How many different designs can I have under each scratch off area? that can be put under a scratch off area, so if you wanted every single scratch card to have a unique design or individual prize you could. This decision is not limited by printing capabilities – so it’s ultimately up to you. What colour can the scratch off latex be? The overwhelming majority of customers will opt for latex in its “natural” state i.e. in grey/silvery colour that most of us are familiar with. It’s the colour that is found on the majority of scratch cards. Gold is another alternative which is popular and won’t cost too much more to do. In theory, you can have the latex in a more inventive colour but this isn’t necessarily a cost-effective option. What stock can they be printed on? Scratch cards can be printed on a variety of coated stocks but it’s important to note that uncoated stocks won’t work very well. It depends on the quantity you require but it will take an absolute minimum of two days. It normally takes about 5-10 days for each job. How many do you normally print on a run? The average amount is about 5000, but we can accommodate anything from a run of 200-300 scratch cards, right up to 250,000; so really, it’s up to you. What size of scratch card can you print? We can print any size of scratch card up to A3, though obviously most scratch cards are a lot smaller than this. Yes, scratch cards are recyclable. Like other printed items they’ll need to go through the standard deinking process. What is a rub remove latex? Rub remove latex is the latex we use on our scratch cards. It is an aluminium paste mixed into a medium to make it printable. The medium binds it together but keeps its varying colours. We use a clear varnish directly under the latex (in the exact same shape) so that it can rub off easily. Rough, uncoated papers are not suitable for applying latex to, as the rough surface traps the latex and stops it rubbing off. A varnish won’t prevent this, as the surface is too porous, and the varnish will absorb straight into the paper, instead of sitting on the surface. Sometimes we’ll use two layers of varnish to accommodate for this – the first is absorbed so that the second can sit on top. What is the process for printing latex? Unlike other methods, our process does not involve raising the image underneath the latex. The process of putting the latex down is similar to t-shirt printing in that it is a silk screen process. The process involves pushing ink through a stencil using a rubber squeegee. The latex stencil is a static image (meaning it’ll be the same very time) but you can have as many different variations of image underneath as you like. We like to let the latex dry completely by leaving it over night for best results. For more FAQs around scratch cards, click here.